For almost a year now, I have been planning an exit from my full time job to re-enter consulting. The date has been fixed for a while and with that deadline in mind, my thinking and planning have accelerated. To avoid developing an overly rigid plan based on unfounded assumption, I am focusing on developing a one-year plan around an overall project which I call my YOL, short for Year of Learning. As I continue to take MOOCs, read, write and allow ideas to percolate, I have been able to draft a business plan that I can keep tweaking as time passes. This Year of Learning is meant as a way to allow myself to experiment with various consulting models, different types of services, etc... and different markets. A key element of that experiment will be to provide Knowledge Management support to individuals, groups and organizations working on social causes. Perhaps it's a form of social impact consulting. The idea was in the back of my head for a while when I was thinking in terms of potential clients and customers, but it crystallized this past week as I was viewing the videos for "Devenir Entrepreneur du Changement," a very good MOOC in French from HEC and Ticket for Change (offered on Coursera). 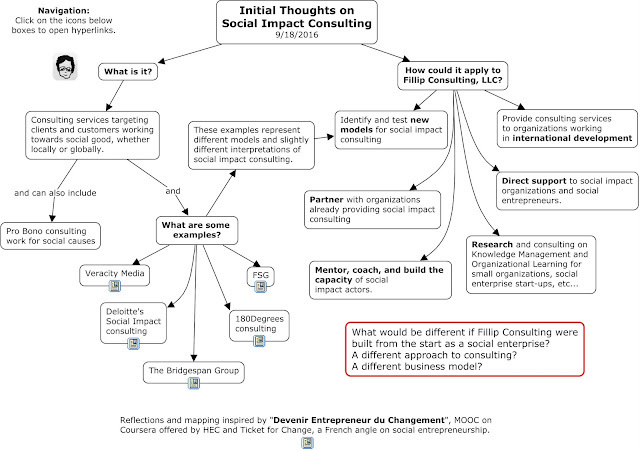 One of my goals will therefore be to test various social impact consulting models. For example, would virtual coaching of social entrepreneurs make sense? Could I provide one specific project with ongoing advice, KM and M&E support? Could I provide a KM and M&E course or collaboration space for social entrepreneurs? 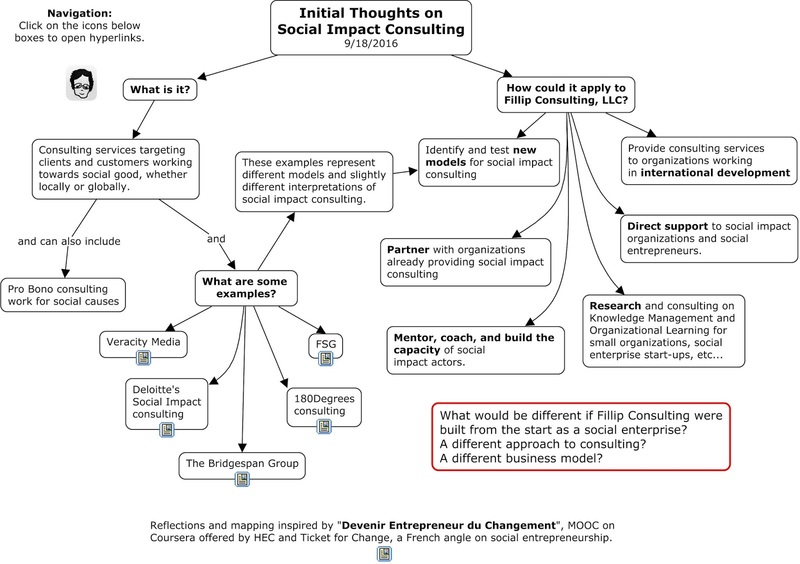 Social impact consulting isn't a new concept. Consulting for any organization working in international development may be considered social impact consulting. Many corporations have social responsibility programs. Working with or for such programs may count as social impact consulting. Those may well be key potential clients/customers for me in the future, but the true test of social impact consulting would to provide direct support to social entrepreneurs and non-profits operating on the ground, whether domestically in the US or globally. I've also posted the map in its html version (with working hyperlinks) in my new space for insight maps. Check it out here.